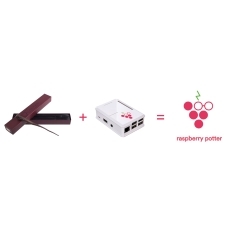 "Raspberry Potter is an open source project that lets you control things around your room or your house with a magic wand. Imagine if you had a magic wand to control everyday things. Once you make a Raspberry Potter, you’ll be able to do just that – by drawing simple gestures in the air." As opposed to searching, I got this accordinged to the assessments as well as couldn’t be better. That is actually beautifully made and definitely does hold this’s form. Hi here, just turned out to be receptive to your blog site through Search engine, and found that it’s really entertaining. I will take pleasure in if you carry on this idea. It’s appropriate time to put together some options for the forthcoming future. I have digested this posting and if I have the ability to, I want to propose you a few intriguing recommendation. Only wanna input on few general things, The website design is perfect, the subject material is real great. “To establish oneself in the world, one has to do all one can to appear established.” by Francois de La Rochefoucauld. Download Mozilla Firefox latest version,Mozilla corporation has developed this search application now install this app from Microsoft store.